The Poodle has a long history – as far back as 400 years throughout Russia & Western Europe - depicted in 15th century paintings and in bas-reliefs from the 1st century. The subject is controversial of where the dog was officially developed and no one really knows the breed’s true country of origin, but it is believed this breed originated in Germany or Russia. What is certain is that Poodles are descendants of the now extinct French Water Dog, the Barbet and possibly the Hungarian Water Hound. The name "Poodle" most likely came out of the German word "Pudel," which means "one who plays in water." Poodles were also called “Caniche” meaning ‘duck dog’ by the French people. The "Poodle clip" was designed by hunters to help the dogs swim more efficiently. They would shave their fur so as not to be dragged underwater with the weight of water in their coats, but would leave their joints and organ areas covered to protect them from the extreme cold winter waters when retrieving fowl and sharp reeds. Hunters in Germany and France used the Poodle as a gundog and as a retriever of waterfowl and on land to sniff out truffles lying underground in the woods. The Poodle has the largest brain per skull size of all dog breeds and excellent at ‘reading’ people and experiences. The myth that they are ‘barkers’ is untrue. Poodles make an excellent watchdog & guard dog [Standards because of their size]. They are extremely sensitive and aware of suspicious people with motives. Extremely intelligent, they were popular performers in circuses throughout Europe. The Toy and Miniature Poodle varieties were bred down from larger Standard Poodles. In the 18th century, smaller Poodles became popular with Royalty. Today we have three official sizes: Toy, Miniature and Standard Poodle. They are considered one breed and are judged by the same written standard but with different size requirements. Breeders are also breeding an in-between size called a Klein Poodle (Moyen Poodle) and a smaller Teacup Poodle. This versatile breed, in sizes, excels in many arenas, including hunting/retrieving, agility, flyball, watchdog, competitive obedience and performing tricks. •	Extremely Intelligent, largest brain per skull size of all dogs makes this breed the smartest in numerous arenas, including hunting, retrieving & dog sports. •	A great watchdog in surmising trouble and danger against any family member. •	Agile, athletic and noble. •	Playful, dignified personality, friendly, loyal ~ a great family dog. •	Great with kids ~ a natural protector, staying close to protect young toddlers. •	Great with other pets. •	Hypo-Allergenic ~ a great dog for allergy suffers. •	Require lots of grooming, as they don’t shed – therefore regular professional grooming. •	Calm disposition, not a ‘barker’. •	Needs regular physical & mental stimulation. •	Not good to be left alone ~ will suffer from separation anxiety. •	A great apartment/condo dog even for their size. •	Live longer than the majority of breeds ~ 17+ can be expected. While the poodle is well known for his look, there are other characteristics that make it just as enjoyable and should be the reason why you invest in this dog. The poodle is a highly enjoyable pet, with lots of character and plenty of cheer in him. They are very intelligent dogs and with that comes a very good amount of training ability. You will also find that they can be temperamental. A good sign of this is when playing with or spending time with someone other than him, the poodle is likely to become overly sensitive and either try to interact or sulk. They enjoy being the center of attention and being their master's true companion. You will find that the miniature poodle makes a great addition to training shows and events simply because he likes to learn to do tricks. They want to entertain and have fun, and making their master happy is a great way for them to do that. You will find too that when he is able to make you happy, it is funny and adorable to be around. In terms of other dogs and children, the poodle will adjust well. While he likes to be the center of attention, he is, beyond anything else, more than willing to play with anyone that wants to play with him. On the other hand, some miniature poodles will show signs that they are less than inviting of this type of attention. Some are very nervous around people they do not know and other animals. Some are sensitive to the time that you spend with others, too. Some poodles can be high maintenance like animals because of this. In an effort to help them to adjust better to those around them, do socialize these dogs as young as possible. This will help them to open up to strangers and help them to feel more at ease when someone new is around them. The good news is that the poodle is more than willing to learn, at any age. In addition, the miniature poodle is more than willing to protect what is his. He makes a good watchdog, being vocal when necessary to ward off those that come near to him. Yet, they are not necessarily aggressive dogs. While they will bark, and bark quite a bit, they are not likely to attack anyone. Perhaps the hardest part to owning a miniature poodle is having the time and the skill to groom these dogs. They do require quite a bit of grooming. They will first need you to bath them often, often weekly. They like to be clean but they do need help in maintaining themselves. They will also need to be clipped every other month at the least, although some will allow the poodle's coat to grow much longer, this is not often safe. The hair of the coat will become matted especially if not brushed often, which is not only a problematic situation for the groomer, but also does pull at their skin and makes them uncomfortable. The poodle's ears also need to be cared for. You will find mites and ear hair in them often times, which must be removed. Hair here needs to be removed for comfort and cleanliness. Clips are generally used as well. The most traditional are those that are used to help reduce the weight of the dog's coat. This allowed them to swim better and provides some protection for joints and the organs of the pet from having to overwork as well as from the cold. The miniature poodle is a great choice for many reasons, including this one. As a highly energetic dog, they are likely to demand at least some physical attention and activity by you. They do like to play either with you or with children. They will even enjoy themselves with a dog their own size and age. You should take note in their physical activity, though. Many of the health conditions they are predisposed to face are brought on by a poor diet and lack of exercise. The miniature poodle is not likely to be demanding of you, though. They will take the exercise they are given and will truly appreciate the activities you do with them, but they will not beg for it. The poodle is a great swimmer and they often enjoy the exercise that a pool or water body can give to them. They are good for walks too, but their short legs are not necessarily capable of keeping up with a big bike or a long term run next to your side. An important part of enjoying your poodle will be allowing him to run. Providing a fenced in area is a great opportunity because running without a leash allows them to truly enjoy themselves. And, playing catch with them or spending your time chasing them will make it even more enjoyable for them. 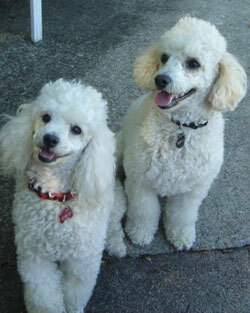 Miniature Poodles love to play with you and get a good amount of exercise. They are not lazy dogs that want to lie around all day, but would rather enjoy time running and playing. The miniature poodle is a great find for many reasons including their intelligence. They have served as being some of the best and smartest dogs available and for that they have a long history of training. Often, the dog's will do best with positive, rewarding training because they enjoy pleasing their masters and often are more than willing to do anything to showcase that love that they have. As mentioned, they are highly trainable and this has played a significant role in their lives and history. Being highly trained circus dogs made them an enjoyable yet hard working dog. They loved every minute of it and they do enjoy being trained now. It often seems they like a challenge and are willing to learn what you teach and what makes you happy. You will find that the miniature poodle full of talents. This includes being a watch dog, being the trick performer, being very obedient and even competitively so. They are very agile dogs even for their small size and light weight. You will find that they are excellent at learning to retrieve. You can teach them to do nearly anything. When you provide these dogs with a happy, companionship based life, it is likely that they will learn anything you want them to.